This excellent walk makes its way through the west cliffs of Mont Granier, and although from both the road and from the map, it looks steep and tedious (map), in reality it's a wonderful walk that deposits you close the summit of the hill. 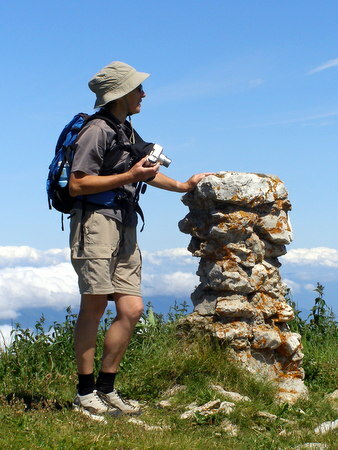 Other guides recommend that the walk is started from Tencovaz, located near the Granier ski station. There would appear to be some sense in this if you intend to return by the same route, but doing so goes against the grain, and it is not recommended as a descent route. Moreover, Tencovaz is a tiny hamlet, and has no parking available which doesn't encroach upon someone's personal space. The walk starts from la Plagne, and you should leave your car at the parking area on the right just before the village (1080 m, grid ref. UTM 31T 72716 50364). From la Plagne, walk back down the road for a few minutes, and turn off to the right along the road signposted Tencovaz and vers le Mont. This is the GR9a, and leads up a hill to a mast, where it becomes a track and turns back on itself. Some 45 minutes after leaving the car, you enter vers le Mont - a small collection of barns. The next section of the route is somewhat off the orthodox track, and requires a little care, although it is traceable on the IGN map. At the last barn, the track divides. The GR9a continues to Tencovaz on the track below the barn. We take the track above the barn, which rises up through the hayfields towards the forest. At the top of the meadows, a track can be found just in the trees to the right, behind a broken-down dry stone wall. This soon divides - take the one that contours round to the left. This soon turns into a path, and descends round the back of a valley over some minor streams. It then ascends through some open ground, re-enters the forest, and turns into a track again. This also soon divides - take the path to the right which leads after a couple of minutes onto a piste, some quarter of an hour after leaving the meadow. We are now back on the orthodox route from Tencovaz. Ascend the piste, using the zig zags where possible. It isn't the most pleasant of ground, but the wealth of insects and butterflies is adequate compensation for any discomfort . At the top, turn left past the ski lift to a cabin (1220 m), reached after about 25 minutes. The path continues behind the cabin, and rises steeply through the woods for another 25 minutes, before emerging on a steep alp. There is a narrow line of scree rising towards a gully in the cliffs above, and a path of sorts runs up alongside it. We ascend this to reach the gully after yet another 25 minutes. This has an impenetrable wall at the back, but the route now starts to become more interesting. Enter the gully, and towards the back scramble up to a sangle which swings south, ascending a couple of rock bands (Difficulty 2) en route. Finally, the path enters a chimney which is climbed to a ledge. A short wall then needs to be climbed (also Difficulty 2), which leads to a very attractive sangle path that heads back to the north. This rapidly rises to the ridge (reached some 30 minutes after entering the gully) where we are immediately overwhelmed by the view into the Isère valley, and across to Mont Blanc. Here we turn left to traverse 650 m of splendid crest with outstanding views in all directions, towards the rather uninspiring summit which is reached in well under three hours from the car. It is capped by a small cairn. Although the views are stupendous, it is well worth continuing for a further 300 metres to the Cross of Granier. This is situated dramatically on the edge of a buttress right at the corner of the northern cliffs. Behind, you can see all the way down the Vallée d'Entremont to Chamechaude; ahead may be seen the town of Chambéry spread out, and the Lac du Bourget; and to the east the Alps disappear into the distance. On a clear day, the Mont Blanc range looks close enough to touch.